Crooked posts can throw a decking project into a tail spin in a hurry — “almost stright” won’t fly. To make sure you’ve got everything on the level, you need a bit of right-angled help from a post level. It isn’t much more than a 90-degree plastic piece with a level bubble on either side, but that’s all you need for quick adjustments to get a post or beam straight. It also features a hook and loop strap that allows it to stay put hands-free while you cuss a lot and bang on the post to get the angle just right. It may be a pain to stop and check each post and beam you put in, but trust us: you’d rather know now than wait until you’ve built a complete parallelogram later. And at just $5, you don’t have to be gentle with it or worry too much about dropping your expensive $50 level into concrete mix at the bottom of the post either. Now if they could only make one of these that would tell you if the post was turned in relation to the other posts. I have one, and am surprised how much use its got. I’ve used it when installing my satellite dishes, bird feeder posts, and installing my flag pole. A must-have for every toolbox as far as I’m concerned, but as Kurt said, it has its limits! If you’re installing a fence, get two – they’re cheap. 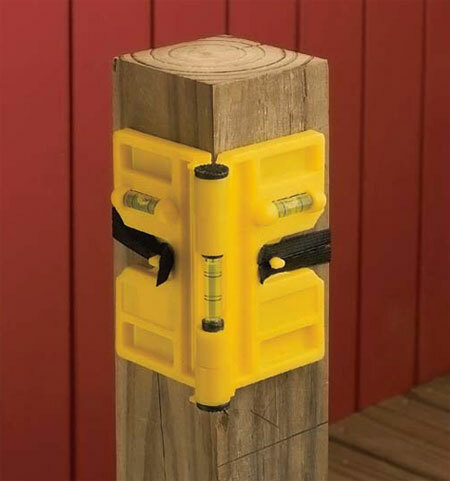 Lacking one of these and trying to build a deck with a friend over a holiday weekend I substituted a bubble level laid on the top of the posts and a string guide to keep me lined up. Not the best way, but it worked. I’ve gone through a couple of them. Spend the extra $2 to get one like in the photos. The cylinder in the corner is a hinge which keeps them from breaking so often.